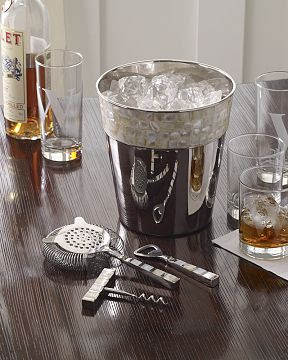 Sometimes a silver ice bucket, pretty tray, and just a few glasses set out in a casual book-filled room have far more appeal than a ballroom done-up by the hippest party planner. Obviously New Year's Eve is an ideal time to put together a setting like this, but a silver cooler, pitcher or any sort of serving piece is fun to use all year long. Instant, effortless elegance. Right now Atlanta is participating in The Literary Center's Big Read. 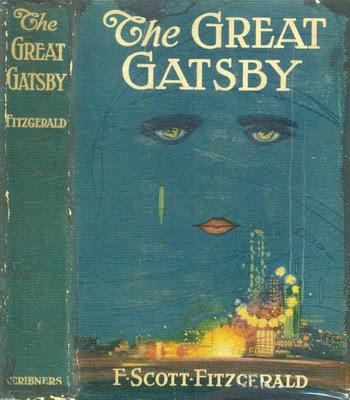 Everyone age 12 to 112 is encouraged to form a book club and read The Great Gatsby before June 2009. So I've been thinking about the scene in the film when Gatsby has all the silver sent to the modest summer cottage for that afternoon date with Daisy. 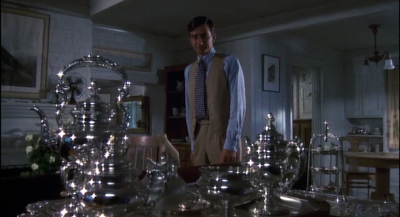 The silver used in the movie is fairly lavish. These days though only one or two pieces are really needed for big impact. Personally I'm drawn to wine coolers because they make such nice containers for flowers when not chilling a bottle. 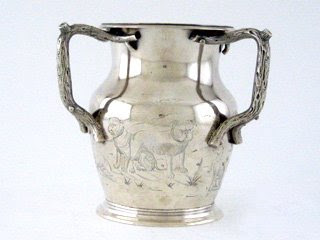 This antique wine cooler from Beverly Bremer is sterling silver and engraved with greyhounds and bulldogs. 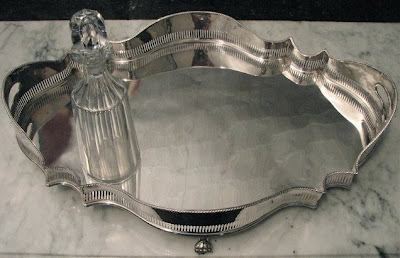 Lovely silver plate examples can often be found at estate sales and gift shops too. In 2009, instead of buying lots of throwaway items each holiday, consider investing in some sort of versatile pewter or silver item that catches your eye. Williams-Sonoma has a nickel plate and mother-of-pearl option priced at $58. Here's another small (and free) gesture that requires minimal effort yet speaks volumes: If you use writing paper printed, engraved, or embossed with your name, scratch a line through the name when sending a note to certain friends. This feels less distant, according to Vogue's Book of Etiquette. 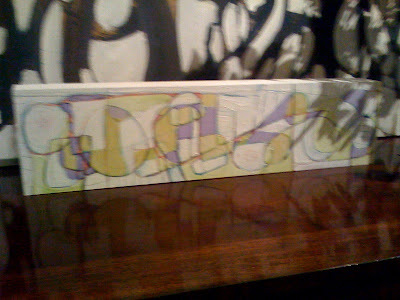 Over the holidays I received a brief note from a seriously chic person who did this. It was a wonderful personal touch. 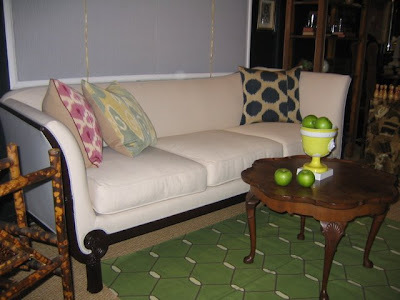 Images one and two are from Accents on Accessories. Dan Carithers designed the first setting, Gerrie Bremermann the second. The note card image came from Vogue's Book of Etiquette, 1969. 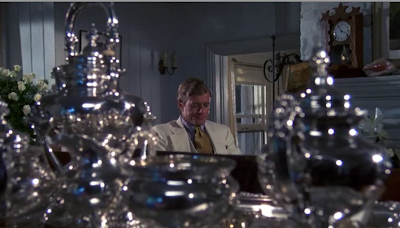 The film stills are from Paramount Pictures 1974 movie, The Great Gatsby. A few years ago, Southern Accents asked regional tastemakers to share their thoughts on Southern style. 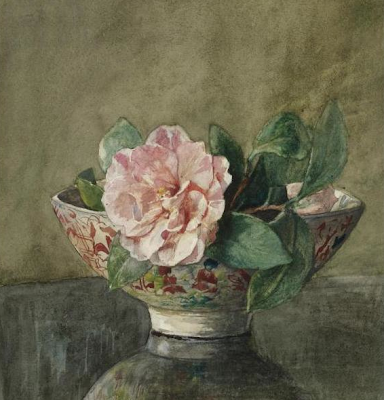 Charleston-based designer Amelia Handegan said, "No Southern house should be without a bowl for camellias." I loved her reply because the idea is so timeless and accessible. Sure, the bowl might be sterling or 18th-century porcelain, but it could also be contemporary glass from Crate and Barrel. 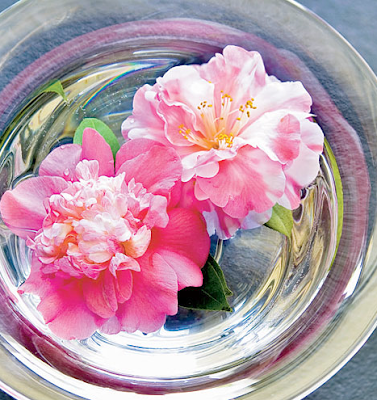 If you are fortunate to have camellias growing in your yard, or in a pot on your patio, think about bringing some blooms inside -- even if you float just one on your bedside table. 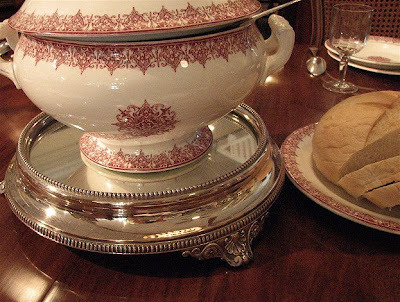 Erica George Dines photographed the pink camellias in the Yeoward crystal bowl for Southern Accents. 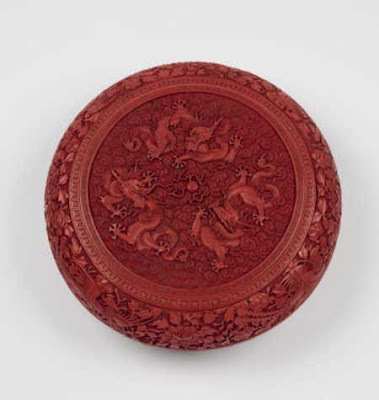 The example above is a fine, large carved red lacquer box and cover from the Qianlong period. The form is circular and the top is deeply carved with a circular medallion of three five-clawed, two-horned, scaly dragons in pursuit of a flaming pearl amid cloud scrolls that partly conceal their bodies, all enclosed by a raised geometric border and a band of lotus lappet. Image and description courtesy Roger Keverne. 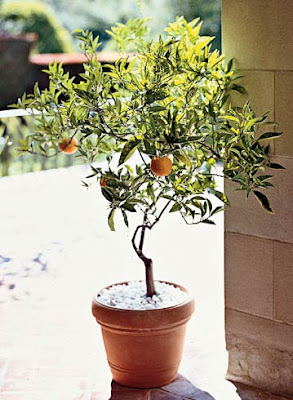 During the holidays, there's a simple alternative to evergreens and artificial trees: citrus. As Southern Accents explains, citrus has long been popular in French-influenced Louisiana. 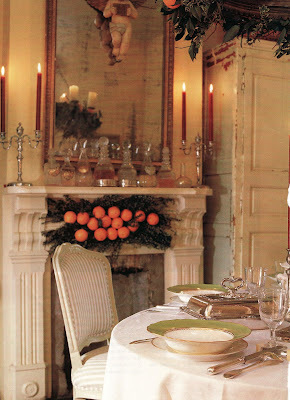 Patrick Dunne, owner of the antiques shops Lucullus in New Orleans and Breaux Bridge, Louisiana, told the magazine, "It's our custom to use a citrus tree as a Christmas tree because until the 20th century, we didn't have scented pine trees here." SA says he decorates his sparingly: lightweight tin candleholders, elegant silver ornaments, and, of course, the fruit itself, which functions as natural ornaments. And when the holiday season is over and temperatures rise, he plants the tree. 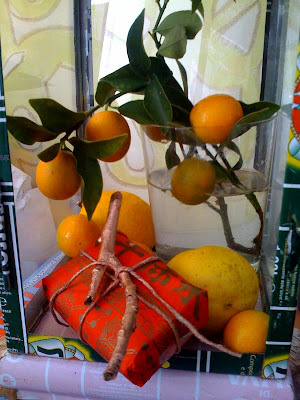 I think citrus would also be wonderful in the home of anyone who does not celebrate Christmas. Somewhere in my files or books, there is a picture of a citrus Christmas tree in Kerry Moody's house, but at the moment I can't find it. Photo at the top by Victoria Pearson; both pictures courtesy Southern Accents. Remember the other day when I mentioned how some of my friends and I exchange imaginary presents? We buy a gift for someone truly in need, and then wrap up a picture of a fantasy present for each other. Sort of, "this is what I'd give you if I could." Well, here is a nice candidate for a passionate collector, or aspiring collector: 1930's hand-embroidered silk panels backed in blue. The dealer I spoke with said these once hung in the drawing room of a celebrated Atlanta interior designer and socialite. I'd love to see what Windsor Smith would do with them. 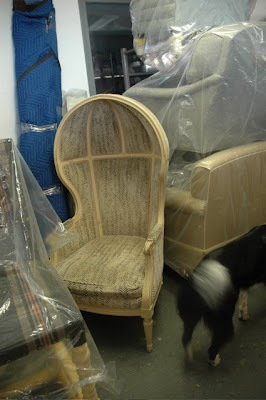 Available at Interiors Market, $1600 for the pair. Call 404-352-0055 for details. 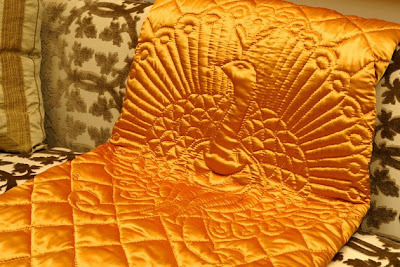 I also like Leontine Linens' throw quilt with Peacock pattern in gold satin charmeuse. 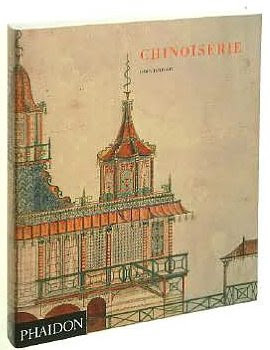 And as always, Dawn Jacobson's Chinoiserie is great related reading. Softcover secondhand editions are available at Barnes & Noble starting at $19.95. This English late Victorian plated silver drinks tray on claw feet with stick pierced gallery and gadroon border by JD and Co., circa 1890, is from Lucullus. Another late Victorian English piece, below, a plated silver mirrored cake stand with beaded border and scroll and palmette feet, circa 1870. Also from Lucullus. Today I received an email from a friend in New York: "What's the name of that amazing culinary antiques shop in New Orleans again?" Lucullus. 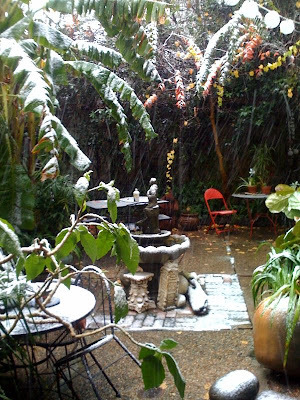 And this evening artist Amanda Talley sent me a quick but enchanting look at her NOLA courtyard dusted with snow. (The lines of some of these native plants are echoed in her work.) So tonight I'm listening to Louis Armstrong's Christmas in New Orleans and Cool Yule. Just wish I had a warm slice of chocolate-pecan pie. 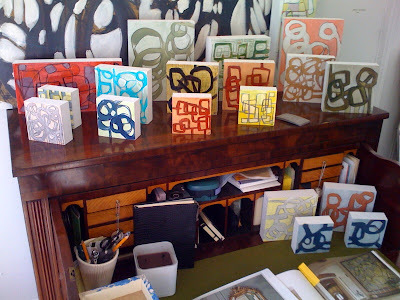 Be sure to click here and see a new glimpse of Amanda's studio. For more views of New Orleans' snow day, click here. 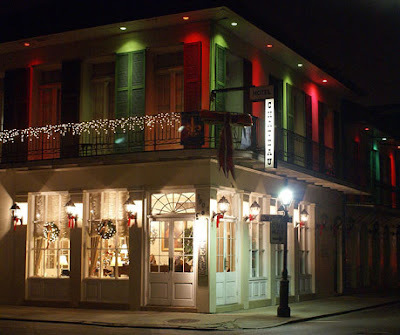 The shots were taken by an architectural historian living and working in the French Quarter. Janet shared this with me and I want to help spread the word. If you plan to be in Boston during the holidays, try and make time to enjoy an excursion to the MFA. 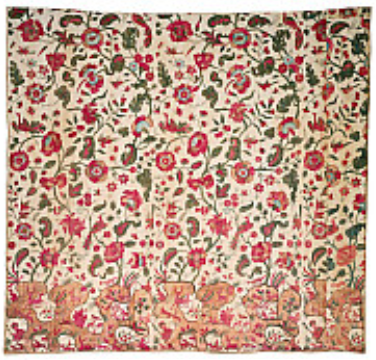 Currently on view is an exhibition that highlights the influence of India and Southeast Asia upon British interior design during the late 17th-/early 18th-century. Related past post: The Garrick Bed. 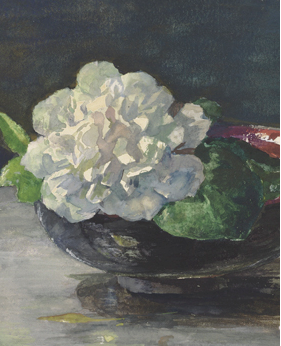 One area that apparently has not experienced an economic hit is the Asian art market. This week Antiques and the Arts reports that record prices were achieved at the 36th Special Auction of Asian Art at Nagel Auktionen, November 10-11, in Stuttgart, Germany. 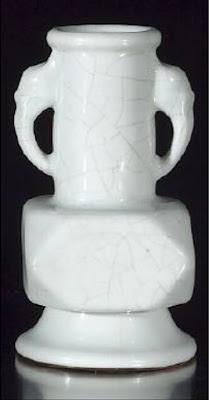 Regardless of the money matters, I wanted to share this striking 18th-century blanc de chine vase. It is a very rare Chinese imperial guantype faceted porcelain piece from the Yongzheng period, and I think the design is absolutely timeless. How I would love to have this vase to use as part of my holiday decorations. 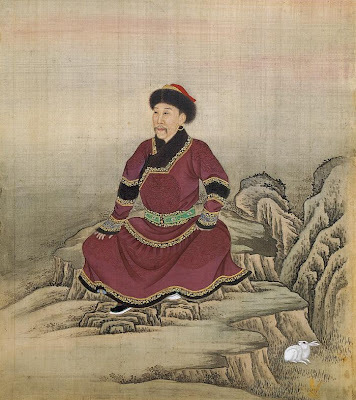 To learn more about China's emperors and the Yongzheng period, click here. 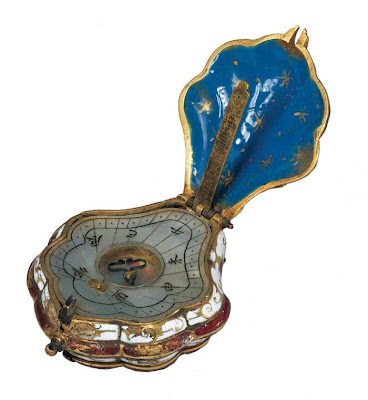 Speaking of stunning imperial art, this Peacock-tail-shaped traveling sundial and compass, from the Qianlong period (1736—95), was included in the three emperors exhibition two years ago. The piece belongs to The Palace Museum, Beijing. 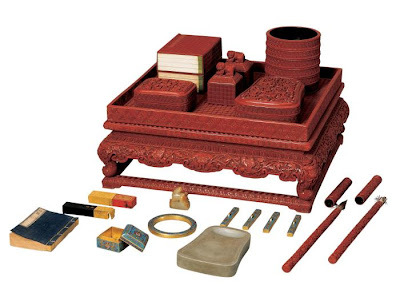 This writing set from the Qianlong period is carved red lacquer, cloisonné enamel, ivory and other materials, also from The Palace Museum, Beijing. On a loosely related note, Grant K. Gibson recently visited the lovely home of Suzanne Rheinstein and photographed her many exquisite chinoiserie and Asian pieces. It's a must see. Below are the cricket boxes I mentioned a few months ago. Gallery owner and artist, Amanda Stone Talley, is celebrating in her spirited hometown, New Orleans, and wrapping her presents in a thrifty but soulful style. For the tiny gifts it's tea paper from Pearl River bound with twine and a twig painted gold. "I just get a small limb, spray it gold, and then break off a little piece for each present." 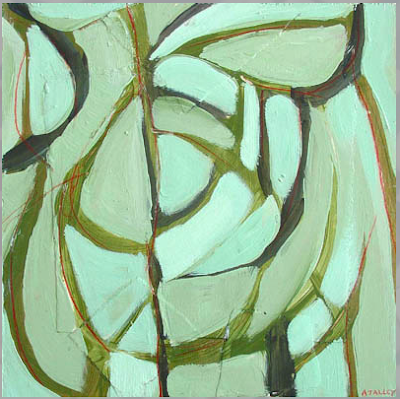 Talley earned her MFA at SCAD, she was a Fighting Squirrel, and for eight years she worked with Gerrie Bremermann. Imagine all the interesting things she's seen. 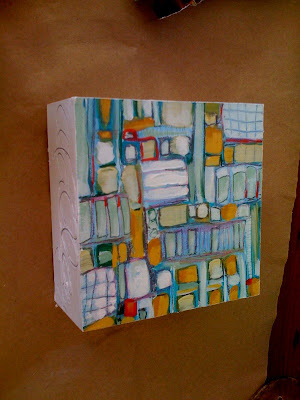 Next week she will be showing some of her more modestly priced work -- small cubes priced between $120 to $160 -- as part of a casual happening at her gallery, Studio Amanda Talley, 2369 Magazine Street. If you plan to be in the area, be sure and stop by. To learn more about Amanda's work, click here. Soon we just may be seeing a few new festive Crescent City sights, courtesy of her iPhone, so stay tuned. The image below is via Cami McCormick and CBS News. Click here to see the entire 2006 photo essay with a diverse range of images from a Big Easy holiday. 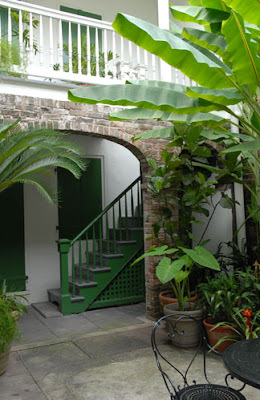 For more of Thomas Jayne's wonderful New Orleans digs, click here. Kerry Moody also incorporates citrus in his decorations. Note the red candles. Images courtesy Southern Accents. 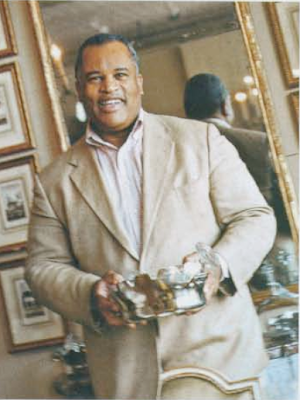 Moody's decanters are 19th-century, the coffee set and gumbo bowls are Vieux Paris, also 19th-century, and entree dishes are Sheffield. Note too the traditional French sweets. Here's a direct link to holiday tips from Kerry. Below, Moody at work, arranging vignettes for Lucullus. And of course Amanda's former boss, Gerrie Bremermann, sets an exquisite table. Images here are also courtesy SA. I know many of you are anxious to learn a little more about Vicky. Soon her site will officially launch, but you can contact her here. 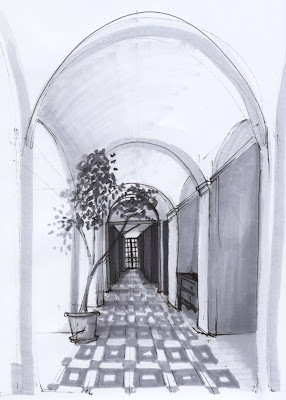 She does commissioned work including interiors, house portraits, and custom cards. Originally from Buenos Aires, Vicky left home to attend the the Rhode Island School of Design, where she majored in furniture design. Ultimately she had to move back to Argentina, and she completed her education there with a BFA in Painting and Education. 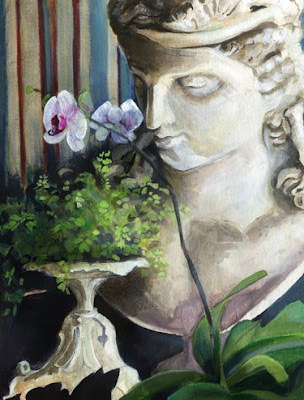 She says, "A fine artist sometimes finds herself doing anything and everything..."
After moving to Los Angeles with her husband, and working at an array of jobs, Vicky began pondering her childhood interest in beautiful rooms. Like so many readers I hear from, as a little girl she constantly re-arranged her bedroom and her parents' things. In L.A. she applied for an interior design internship. "Little did I know that I was going to end up in the hands of Ruthie Sommers! I was so thrilled to get the opportunity to work with her, but also to discover my new passion. I became her project manager, which I must say has been the most [exciting] job I’ve ever had. Her creativity is truly contagious. 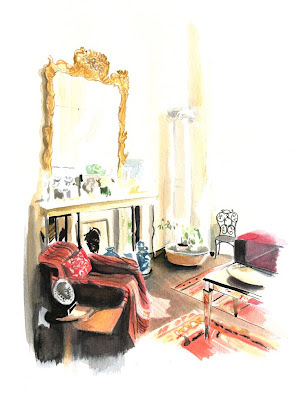 Working closely with her, picking out beautiful fabrics and trims, going to project sites, visiting vendors, overlooking her latest creation, and literally jumping and screaming in excitement over a new idea or yummy antique settee has been a really fun process." 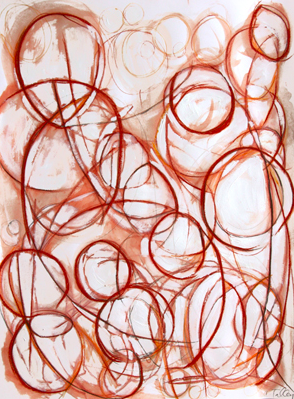 Vicky's art had primarily been abstract and large-scale, but one night she went home and started sketching Ruthie's ideas for a client on a scrap of paper and got carried away. The next morning, she shyly brought them to work. Ruthie got a peak and said, “Vicky you have to do this! 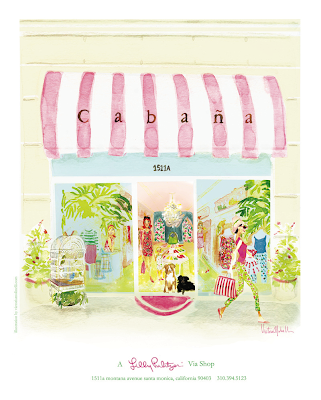 These are great!” So that prompted Vicky to take her illustrations and renderings to the next level. Click here for a review. 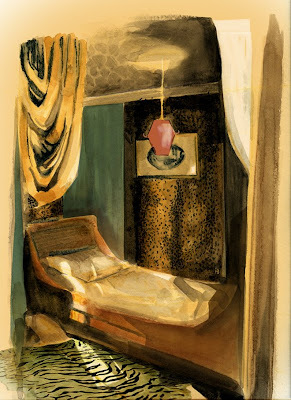 Afterthought: You may find the room below looks familiar. 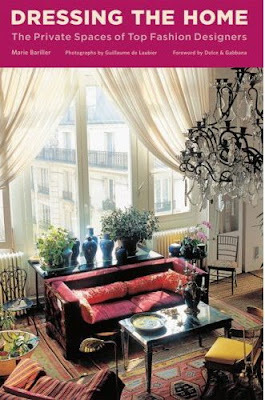 It's the lush apartment of Yves Saint Laurent muse and designer, LouLou de la Falaise. Vicky was inspired to paint it after pouring over the book, Dressing the Home. To see other views of the apartment, click here. Victoria is actually not the woman pictured above with Ruthie, but I included the shot because it works with the story and it's a personal favorite!